Liberty Cap to Right - A changing design. 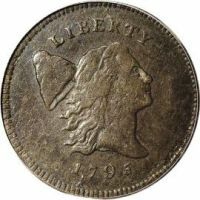 Robert Scot was the chief engraver for the 1794 issue of the liberty cap. He changed the look of it from the previous issue in several ways. The most noticeable is Liberty's head facing right. Also, the cap and the portrait of liberty on the obverse are both larger. The reverse of the coin is similar but it does not have strings of berries that the Liberty Cap Left version does. The 1794 pieces are made of 100% copper and have a weight of 6.74 grams. They have a diameter of 23.5mm and have edge lettering. The mint employed John S. Gardner as designer between 1795 and 1797. 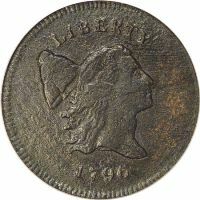 He made some minor changes to the coin including lowering the weight to 5.44 grams in 1795 and omitting the edge lettering. 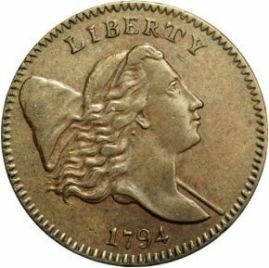 The fledgling US mint had continuing difficulty meeting copper demands. This resulted in limited mintages of these coins over its four year history. During 1794 to 1797 approximately 359,500 pieces were struck. 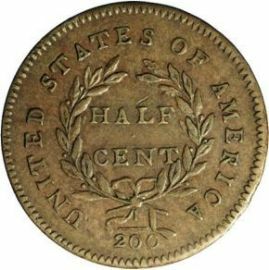 Most half cents from this series were made from cut-down Talbot, Allum & Lee tokens. The production methods of the time were relatively primitive. Although some coins appear to be struck more carefully than others, the majority of these coins have weak strikes that can be easily confused as wear to the untrained eye. Some of the rather well known varieties of this series include the following. mint errors. It was caused when the mint engraver's hand slipped and gouged the die that was used to make the coin. The No Pole to Cap variety (pictured at right) was only coined in 1795 and 1796. It is a result of the changes made by John S. Gardner when he took over as designer in 1795.